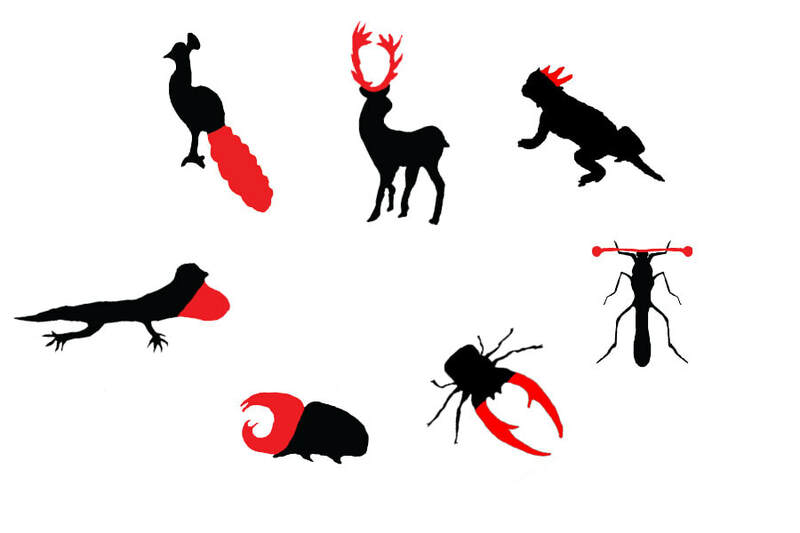 Examples of sexual selected traits (clockwise from left): Pheasant tails, Cervid antlers, Lizard horns, Diopsid eye stalks, Stag beetle mandibles, Scarab beetle horns, Lizard dewleps. (Image modified from Lüpold et al 2016). Numerous studies have established the important role of sexual selection in the rapid diversification of sexual traits such as ornaments, armaments and courtship behavior. These traits also tend to be energetically costly to develop and maintain. Theory predicts that the strength of sexual selection increases, males (in particular) are predicted to disproportionally invest in such traits. As a consequence, expression of such sexual traits tends to depend on male physiological condition, and likewise may reliably serve as an index of relative male genetic quality. Further, investment in costly reproductive traits is expected to trade-off with important life-history traits (e.g., age at maturity, longevity, breeding schedules). Evolutionary relationships such as these serve as a foundation for models of female preference evolution and they are critical determinants of species differences in mating system and demographics. We are interested in exploring the relative contributions of environment, genotype and their interaction to variation in reproductive character expression among closely related species and populations.